Two of the anti-tobacco murals painted by students at Florida Memorial University. MIAMI GARDENS, Fla. – On Tuesday, April 18, ‘truth’ and the CVS Health Foundation joined students and faculty at Florida Memorial University (FMU) to unveil a new tobaccofree campus mural. 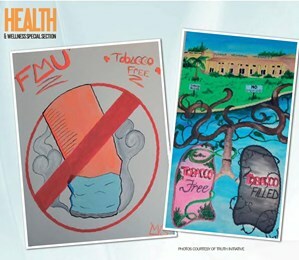 FMU was one of five schools to win a tobacco-free mural contest sponsored by the youth smoking prevention campaign and the foundation. Some faculty, staff and students have drafted a tobacco-free policy recommendation they plan to present to their administration by the end of the semester. Hundreds of students came out to show their support of the school’s tobacco-free initiative, as well as E. Ray Smith, who is one of FMU’s board members. The event involved snacks, free shirts, games and music for the FMU student body. “With 99 percent of smokers starting before age 27, college campuses are critical to preventing young adults from starting tobacco use, aiding current smokers in quitting and reducing exposure to secondhand smoke for all,” said Robin Koval, CEO and President of Truth Initiative, the national public health organization that directs and funds the ‘truth’ campaign. According to ‘truth,’ Tobacco is not an equal opportunity killer. Tobacco-free campuses are especially important because African Americans, low-income neighborhoods, LGBTQ communities and those with mental illness have been profiled by the tobacco industry for decades. Therefore, ‘truth’ and CVS Health Foundation partnered with students and administrators at FMU and over 100 other Historically Black Colleges and Universities (HBCUs), as well as community colleges across the country, to support their efforts to adopt 100% smoke or tobacco-free policies. By speaking, seeking and spreading the truth about tobacco, the Truth Initiative said it has helped bring teen cigarette use to a record low of six percent!